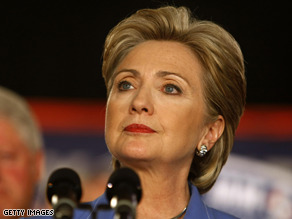 Clinton has loaned her campaign a total of $11.4 million. WASHINGTON (CNN) - Democrat Hillary Clinton has loaned her presidential race $6.4 million over the last month, bringing the total amount of money she has lent herself to $11.4 million. And she is willing to lend herself more money, top adviser Howard Wolfson told reporters Wednesday, a day after Clinton eked out a narrow victory over Sen. Barack Obama in Indiana's Democratic primary but lost to him by a landslide in North Carolina. The $11.4 million she has lent her campaign this year is about the same as the amount she earned from book sales and her Senate salary, Wolfson said. On a conference call with reporters, Wolfson said the loan proves Clinton is committed to staying in the presidential race. "The loans are a sign of her commitment to continuing the race, her commitment to continuing the process and her commitment to staying competitive with Senator Obama on television and other areas," he said. "The campaign continues to raise a lot of money, but Senator Obama, to his credit, is also raising a lot of money." Clinton loaned herself $5 million on April 11, $1 million on May 1 and $425,000 since then, the campaign said Wednesday. The senator from New York loaned her campaign $5 million in February. Clinton began the month of April with close to $32 million in cash on hand, but only $9 million of that total could be spent during the primary season, according to the most recent campaign reports filed with the Federal Election Commission. The report also showed that Clinton owed more than $10 million, meaning she was in the red even before she heavily stepped up television advertising ahead of the Pennsylvania primary in late April. The day after her convincing Pennsylvania win on April 22, the Clinton campaign said it raised $10 million on the Internet. The campaign has not said how much it has raised since her close win in Indiana and her North Carolina loss Tuesday. As a woman, I beg of you, please bow out gracefully with the dignity I know lurks in every woman's heart, from the nomination you cannot win. I honestly believe this would show strength, stature, and purpose helping to restore your reputation. It would be horrible to watch you totally self destruct due to raw ambition, and perhaps poor campaign advice, leaving a soiled memory permanently attached to the Clinton legacy. Way to go Hillary I am going to donate again. This clearly shows her dedication to the American people of what this means to her. Stop... Just stop.... I think we all need to refrain from posting for a day. Just one day..... stop and reflect. Great, more dirty money influencing the process. How did I ever vote for this awful person(Clinton)?Why is she still doing this the election is over? Sasha, Anya, DCer, and others...just remember you're backing the loser. This is a once in a life time chance to make real change for all of the people. Hillary will still be campaigning when they are swearing in Barack in January. Bill Clinton ought to be defeating anytime to Barack Obama. YES WE CAN united together. Isn't it supposed to be all about the people? Please stop doing this to us, Hillary! It is virtually impossible for her to win the nomination, she is using up her own money, what's going on here? Something just doesn't seem right. She's a smart woman and she wouldn't be self-destructing, she must have something to gain from this, but what? Hillary, stop going in the hole...Drop Out Now! Save yourselve whatever money you have left. People know what you're about and. Let's face it, we don't like you or your tactics. No wonder Bill looked so sad standing behind her during her speech! She's taking away his allowance. Clinton I suggest you give up before its to late. You're going to have to back obama sooner or later. If Bob and the rest of the "we'll have to vote McCain" bunch care about this Country as they say they do- prove you're not just for a personality- prove you're Democrats and care about America. And they call US the "cultists". Please. Tyhe writing is on the wall and although it may be a difficult thing to face , it's time for Hillary to stop the madness. When you become your own best financial supporter it's time to have a time out. There is only one true agent for change and that's Obama. She needs to loan herself money, her contributors have given up on the loser. We should all be so "enriched". Congratulations to her for going forward. Clinton will slug this out on the convention floor and I hope she has a big upset. Obama is as arrogant as they come. OK let's all admit this race is over. It is time to stop fighting each other and prepare for the democrats victory in November. Ross Perot resurrected! Those who think having the money to throw around equal to having what it takes to lead others.